We invite you to shop at our retail store – Animal Outfitters. One hundred percent of the proceeds stay at the shelter to help animals in our care. Animal Outfitters sells pet supplies and animal-related merchandise at prices competitive to local retailers and national supply chains. The best part? One hundred percent of the proceeds stay at the shelter to help animals in our care (think of it as a donation from your pet!). Whether you’re preparing your home for a new puppy or restocking litter for your adult cat, Animal Outfitters offers a variety of supplies for dogs, cats, rabbits, guinea pigs, and small animals. We carry all sorts of products – from every day items, like collars, leashes, toys and treats – to special purchases, like calming products for anxious pets and items that help discourage unwanted behaviors. Our mission is to provide the best products for your furry friends – even if that means putting in a special order. 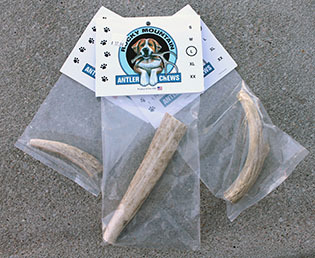 These all natural antlers are mineral-rich and offer a healthy option for big chewers. 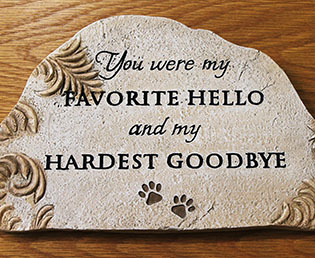 These sweet plaques offer comfort when it’s time to say goodbye to your best friend. 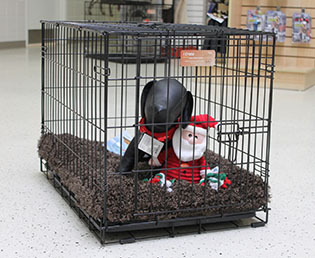 We stock crates in all sizes to provide your pets a safe place to chill out. Whether he’s fully grown or just learning potty skills, we can recommend the best choice for your pet. This is an all-in-one kit to welcome your new cat. 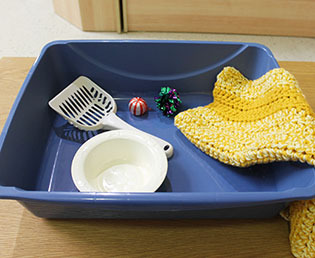 The litter box, scoop and dishes are paired with fun enrichment toys and a kitty cozy to get your new feline off on the right paw.